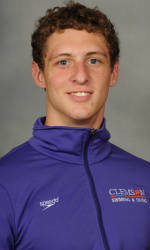 ATLANTA, GA – The Clemson men’s swimming team will take part in the 2011 Atlantic Coast Conference Championship Meet at the Georgia Tech Aquatic Center in Atlanta, GA. The four-day meet will begin on Wednesday, February 23 and conclude on Saturday, February 26. Live video feed will be streaming on theacc.com from 7-9 p.m. starting on Thursday night, and live results will be available via www.clemsontigers.com throughout the championships. The schedule of events will be similar in nature to the women’s event last weekend. Wednesday will feature a pair of relays — the 800 medley and 200 freestyle — beginning at 6 p.m. The last three days will include preliminary heats at 11 a.m. and finals that will start at 7 p.m. Thursday will feature the 500 freestyle, 200 individual medley, and 50 freestyle, as well as the 200 freestyle relay. On Friday, there will be five individual events contested–including the 400 individual medley, 100 butterfly, 200 freestyle, 100 breaststroke, and 100 backstroke–as well as the 400 medley relay. Saturday’s action will include the 200 backstroke, 100 freestyle, 200 breaststroke, 200 butterfly, 1650 freestyle, and 400 freestyle relay. The Tigers are expecting a big event from sprinter Eric Bruck, who ranks third in the conference in the 50 freestyle and is in the top 15 in the 100 freestyle. Chris Dart is also ranked fourth in the ACC in the 100 backstroke and seventh in the 200 individual medley for the season.